You’ve always had a penchant for solving puzzles and problems—especially when it comes to technology. Not only that, but friends and family come to you with all their tech troubles. And they count on you being the first one in line when a new gadget is released. You simply love the innovative and sophisticated world of tech. You have a lot of the characteristics of a person who would make a great software developer: you’re musically-inclined, you like working with people and you stay intrinsically motivated. This techy job seems like a great place for you to start, but you’re probably wondering: What does a software developer do every day? We connected with professional software developers across the country and gathered government data to help you answer this very question. If you’re interested in a sneak peek of the career life of a software developer, then read on. What is a software developer, exactly? You know that smartphone app you rely on? That computer game that kept you transfixed for hours as a kid? That program that helps you budget and track expenditures? Software developers created all of them. Software developers are the creative, brainstorming geniuses behind computer programs. While some software developers may focus on a specific program or app, others create giant networks or underlying systems that help trigger and power other programs. This is why there are two main classifications of developers: software applications developers and systems software developers. What do software applications developers do? According to the U.S. Department of Labor (DOL), developers in this sector are responsible for designing computer or mobile applications.1 The nature of their work is largely focused on creating for consumers. This involves understanding user needs, developing software solutions, monitoring performance and modifying programs as needed. What do systems software developers do? These professionals are focused on operating systems-level software, compilers and network distribution software, as outlined by the DOL.1 This role is more geared toward designing solutions for enterprise organizations. This includes developing software for medical, industrial, military, communications, aerospace, business, scientific and general computing applications. What are some common software developer job duties? Much of the actual creation of software programs happens through the writing of code, and software developers oversee that. Depending on the company where they work, a software developer will analyze the needs of the user and then create, test and develop software that will solve a problem, provide entertainment or simply make life easier for that target market. After mapping out the design, creating flowcharts and drafting out each step of the process, developers will build diagrams and models to instruct programmers how to write the code for the program. Other job duties include mapping out the software to have on record for future upgrades and enhancements, testing the software, and collaborating with other computer specialists to make sure the software is top notch and functioning properly. What skills does a software developer need? Not only are software developers in charge of outlining and creating the code and design for a program, but these types of careers generally involve a lot of collaboration between various stakeholders. It’s important for a software developer to have a combination of technical know-how and excellent interpersonal skills. The whole point of developing software is to create programs that solve the user’s problem. If you’re the type who tends to identify issues and figure out the best way to approach a solution, you may be a perfect fit for a software development career. Not only that, but programming alone is often an exercise in problem-solving and troubleshooting—being able to patiently and strategically tackle potential bugs or issues in code is a big part of their work. Contrary to what’s commonly assumed, software developers aren’t secluded at their desk with no contact with the outside world. In reality, they spend a lot of time teaming up with other developers and programmers to create a prime product for the user. Great communication, empathy and a knack for collaborating with others is a must. Coding and software are enigmas of a sort, and if you’re someone who likes solving a mystery by looking at the big picture as well as the smaller steps along the way, you’ll be right at home developing software. There’s a lot of thoughtful planning that goes into creating these types of programs. If you can figure out the fastest or most efficient path from point A to point B, the world of software development will welcome you with open arms. Creating software can be tricky, tedious work, so it’s important that you don’t get bogged down or discouraged when you don’t succeed the first time you try something. If you’re the type of person who is naturally determined to finish everything you start, you’ll be well-suited for a career in software development. Where do software developers work? As you can see, a variety of industries rely on the skills of software developers. There are also several options when it comes to the work environment, as well as the type of work a software developer may end up doing. Many work in a traditional office environment, but there is also opportunity to work in agency settings or to telecommute. This variety allows you to tailor your career to fit your personal preferences. What is the average software developer salary? In today’s digital economy, virtually everything is revolved around technology. This means qualified software developers are a hot commodity. The BLS projects careers for software applications developers to grow 31 percent through 2026, which is more than four times the national average.2 This is largely due to the growing desire for businesses to produce new mobile device applications. 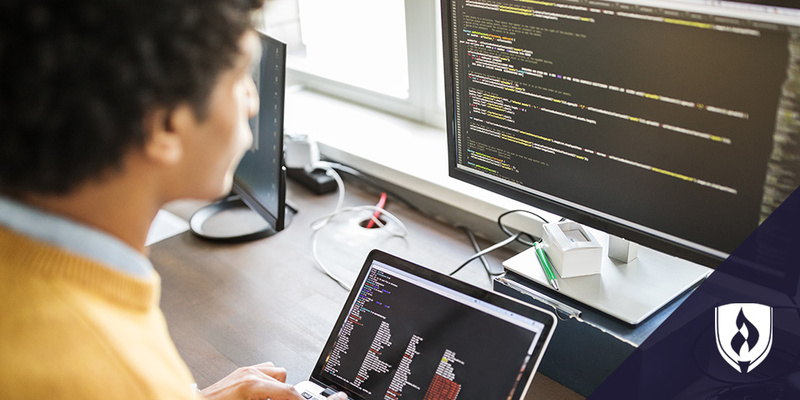 The outlook for systems software developers isn’t quite as favorable, but it is still projected at the faster-than-average rate of 11 percent.2 Although this type of work isn’t as prevalent, it does typically come with higher compensation. The median annual salary for systems software developers in 2017 was $107,600, as reported by the BLS. 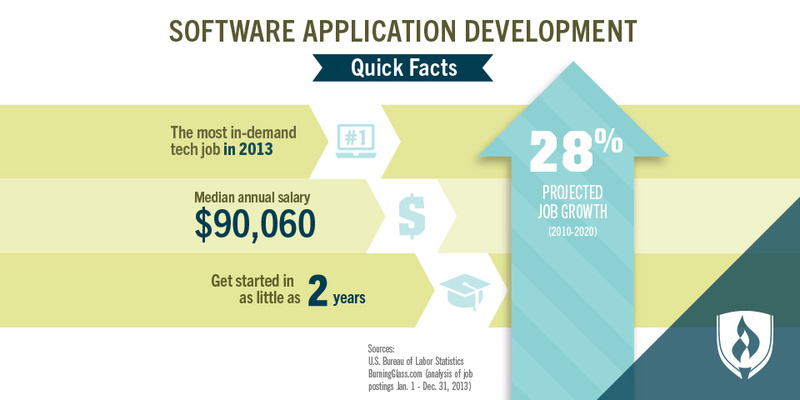 2 On the other hand, software applications developers came in at $101,790. 2 Considering the average for all occupations was $37,690, it’s clear that a software developer salary, regardless of which route you choose, will come with exciting earning potential. The future is bright for software developers of all kinds. Now that you’ve had a backstage look at this critical role, you can better discern if you’re programmed to work in software development. 1U.S. Department of Labor, National Center for O*NET Development [information accessed Sept. 13, 2018]. 2Bureau of Labor Statistics, U.S. Department of Labor, Occupational Outlook Handbook, [information accessed Sept. 13, 2018]. Salary ranges represent national, averaged earnings for the occupations listed and include workers at all levels of education and experience. Ranges do not represent starting salaries and employment conditions in your area may vary. EDITOR’S NOTE: This article was originally published in November 2016. It has since been updated to include information relevant to 2018.